Your bedroom should be a haven, the place that you go to get away from the outside world. We all deserve a beautiful bedroom, so if your room is lacking style and elegance, now is the time to change it. Regardless of what state your room is in, creating an elegant and romantic space isn’t as difficult as you would think. All it takes is some clever decoration and use of the perfect colors, and you can create a gorgeous bedroom. When designing a romantic bedroom, the color scheme that you choose is crucial. Bright, bold colors are anything but elegant, while cool shades and pastel hues add sophistication. If you want to give your bedroom a romantic feel, opt for the perfect color. Grey, cream, powder blue, mint green and candyfloss pink are ideal shades for adding sophistication to any space. When it comes to designing the most amazing romantic bedroom, making your bed the focal is an easy way to go about it. In any bedroom, the bed should be the focal point as it’s the most important feature in the room. If your bed is looking a little worse for wear, think about investing in a new one. For a romantic bedroom, having a beautiful bed frame is a must. As well as looking in your local home store for beds, have a browse at bed frames online. By buying online, you will have a larger choice of designs to choose from, so it’s worth taking a look. One of the best things you can do to make your bed look even prettier and more romantic is choose the perfect bedding. Opt to make your bed as comfortable and cosy as possible, by adding feather duvets, pillows and throws. Use your chosen color scheme to pick bedding that adds style and sophistication to the room. Duvets and throws with lots of detail are ideal for adding extra elegance to your bed – if you’re stuck for a color, opt for white. 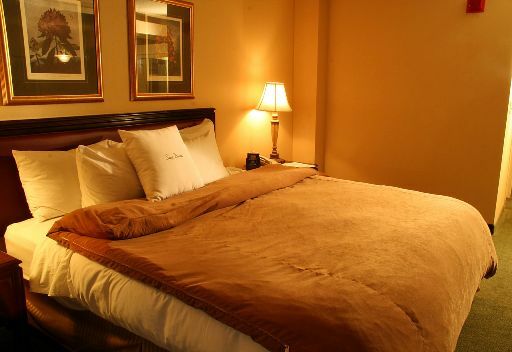 Have you ever noticed how the most beautiful hotel rooms always have white bed linen? If you want to add a touch of luxury to your room, opting for white bed linen is a fantastic way to do this. Remember, the more detailed the design, the better. A simple way to add elegance to your room is by investing in stylish pieces of wall art to dot around. It’s amazing how much of a difference adding a piece of wall art to a room can make to the look and feel of the space. One thing that kills romance is overly bright lighting, so if your bedroom’s lighting is too harsh, it’s important to rethink it. Installing a dimmer switch is a fantastic way to dim your lighting, adding more of a glow. If you are unable to install a dimmer switch, adding table lamps around the room is a fantastic way to create a romantic glow. Popping a string of fairy lights around the room is another great idea for making the space feel more romantic. Making your bedroom romantic is much easier than you think, all it takes is a few simple updates.